Secretary of State John Kerry told his Iranian counterpart that he wished the United States had a leader more like Supreme Leader Ayatollah Khamenei, according to comments made by a senior Iranian cleric and repeated in the country’s state-run media. Ayatollah Alam al-Hoda claimed during Friday prayer services in Iran that in negotiations over Tehran’s contested nuclear program, Kerry told the country’s foreign minister that he "wished the U.S. had a leader like Iran’s supreme leader," according to a Persian-language report on the remarks published by the Asriran news site. "In the negotiations Kerry told [Iranian Foreign Minister Javad] Zarif that he [Kerry] wished U.S. had a leader like Iran's supreme leader," according to Alam al-Hoda, who is a senior member of the Iran’s powerful Assembly of Experts. A senior administration official told the Washington Free Beacon that such a contention is patently absurd. The remarks are the latest in a string of comments made by Iranian leaders purporting to reveal private details of the talks. 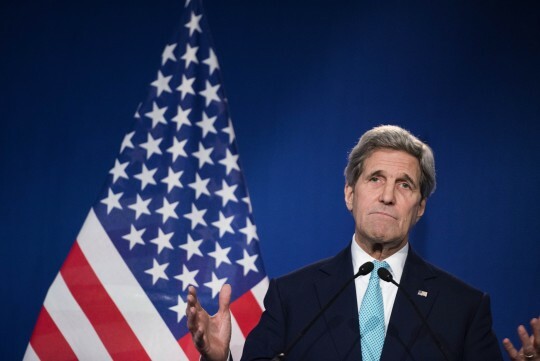 Iranian newspapers have carried multiple reports in recent months suggesting that Iranian Foreign Minister and chief negotiator Javad Zarif was ordered to stop screaming at Kerry behind closed doors. In his Friday remarks, al-Hoda went on to say that Obama is set on striking a deal with Iran by June. "Both Republicans and Democrats want these negotiations with Iran, but they fight each other for partisan interests," he was quoted as saying. "Obama wants the negotiation to succeed so his party can win the next election and Republicans want to stop him." Alam al-Hoda also celebrated Iran’s expansion in the region and controversial activities in war-torn countries such as Syria and Yemen. "Today, the resistance crescent has gone beyond Syria and Lebanon and reached to Yemen," he said. "Today the resistance front is in control of Strait of Hormuz and Bab-el-Mandeb." The "U.S. and Israel have not been so weak anytime before," he continues. "All these events are being managed by the hidden Imam," a revered religious figure in Shia Islam. Saeed Ghasseminejad, an Iranian dissident and fellow at the Foundation for Defense of Democracies (FDD), said U.S. overtures to Iran at the negotiating table have failed to win it any respect from the Islamic Republic’s leaders. "President Obama thinks that by making more concessions he can gain the trust and respect of Iranian leaders," Ghasseminejad said. "However, Iranian leaders neither trust him nor respect him. "Seeing unprecedented weakness in the U.S. president, Iranian leaders do not fear the United States anymore. Partnership, trust, and alliance between the radical Islamist regime of Tehran and United States cannot and should not exist." Meanwhile, Zarif said over the weekend that fighting between the Obama administration and Congress over a potential final deal could not stop America from implementing any agreement the White House signs. "As we have stated since the beginning, we consider the U.S. administration responsible for implementing the agreement and internal problems and conflicts in the U.S. are not related to us and to the implementation of the agreement, and based on the international laws, the countries' internal problems don’t exempt them from implementing their undertakings and this is the main framework that we attach importance to," Zarif said, according to the Fars News Agency. On Monday, Zarif urged the United States to woo Iran. "Maintaining an uncertain and unstable situation is not acceptable to Iran and the Americans should take practical and confidence-building measures to reach a comprehensive nuclear agreement," Zarif was quoted as telling reporters. This entry was posted in National Security and tagged Barack Obama, Iran, John Kerry, Nuclear Iran. Bookmark the permalink.